Counter target spell unless its controller pays (3). 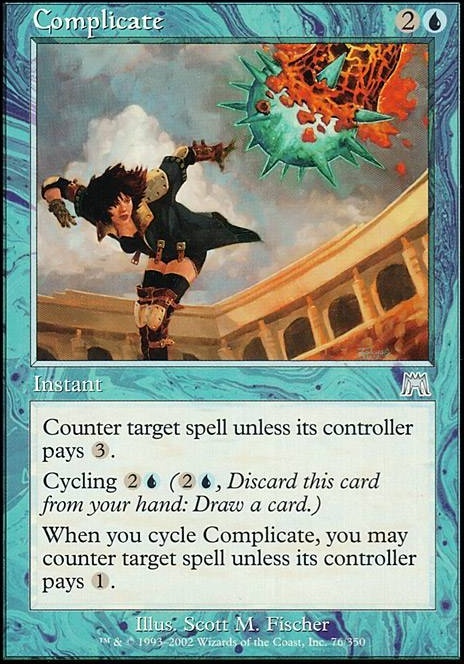 When you cycle Complicate, you may counter target spell unless its controller pays (1). great deck im glad that the cycling archetype has a home it is something i was wondering about before. 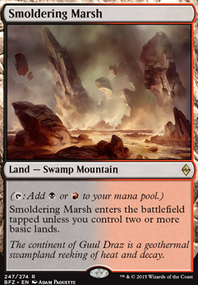 it needs more cyclers and enchantments for zur though. i recommend taking out something like Diplomatic Immunity for Solemnity or Steel of the Godhead or Grasp of Fate. it also is a bit cycle light and it could be hard to chain together a long line of cycling in one turn. some more cyclers you could put in are Vizier of Tumbling Sands, Expunge, Miscalculation and Complicate. Cool deck. I run a Naya cycling deck but it looks like black and blue bring a lot to the table. Suggestions: Fluctuator!, Curator of Mysteries. Nimble Obstructionist, Scion of Darkness, Decree of Silence, Complicate, Grave Upheaval, Limits of Solidarity, Slice and Dice. It looks like you are vulnerable to counters, I would suggest Complicate , Condescend , Counterspell , Dismiss , Forbid , Mana Leak , and Remand . LVL_666 on RA RA RASPUTIN! Oh, and there's Akroma's Blessing, Akroma's Vengeance, angel song, Choking Tethers, Complicate, Decree of Justice, and the list goes on. Those were just more suggestions I wanted to toss out there. Hopefully this helps. As Boza said, this deck seems unfocused. It looks like you are trying to build some sort of 5 color goodstuff, but you lack the interaction necessary to build a deck like that and not die to combo decks. In general it seems like a lot of your cards are suboptimal. Cards like Psychic Strike, Arcane Denial, Complicate and Spell Shrivel are kinda inefficient, especially when you are not running better counterspells like Mental Misstep, Spell Snare, Spell Pierce and Mana Drain, as well as other pieces of early disruption like Hymn to Tourach, Thoughtseize or Inquisition of Kozilek. 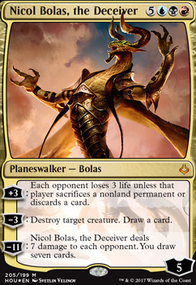 In your deck you mention you made this into a 5-color deck to play Bloodbraid. But playing Bloodbraid when you have this many counterspells (which, remember, usually do nothing when cascaded into) seems loose. If you want to maintain this build, I'd probably play Cryptic Command and Mystic Confluence s my only counterspells (since Bloodbraid can't cascade into them) and instead base my interaction on removal and hand disruption.